When I told my husband I was making a cabbage casserole, he cringed. He isn’t a fan of cabbage! But I am and I love it cooked all kinds of ways whether it’s smothered with bacon or in a casserole like this recipe! Vegetable casseroles are always a popular dish with a crowd. Especially during the holidays. One thing for sure is cheese makes everything better, right. 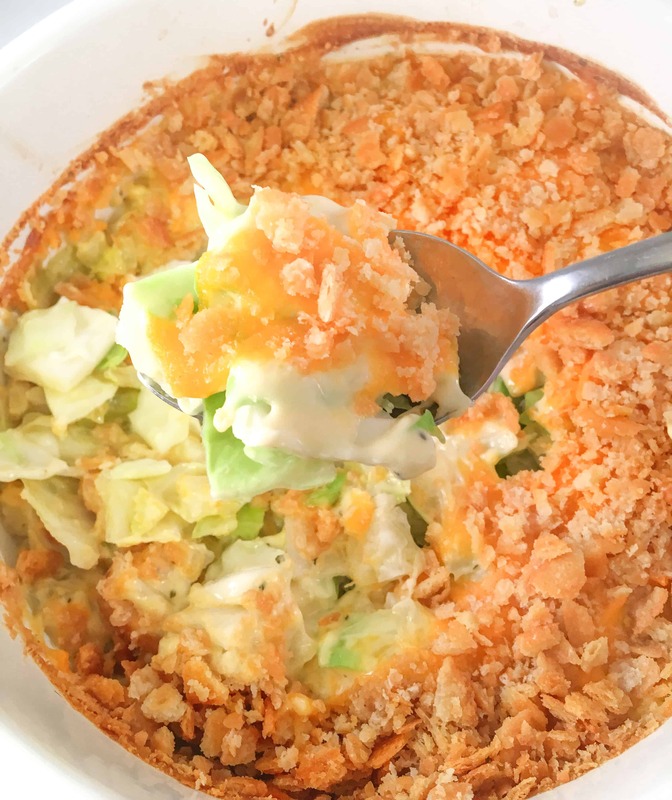 Mix crushed ritz crackers with shredded cheddar cheese for the casserole topping. I like to use mild cheddar cheese for this recipe. However, pepper jack would be a nice change of pace if you like a little extra flavor. This recipe is easy to throw together for a simple vegetable side dish to make any occasion special. Chop the cabbage into 1-inch squares (some people like to shred the cabbage, this works fine, too), add half a stick of melted butter, seasonings, soup, and mayonnaise. The cream of mushroom soup mixed with mayonnaise creates a super smooth, velvety texture. Mix well and pour into a casserole dish. Mix the crushed crackers with the cheese and spread on top of the casserole. Pour remaining melted butter on top of cracker-cheese mixture. The cheesy cracker topping gives it that special final touch. Bake at 350 for 30-40 minutes. 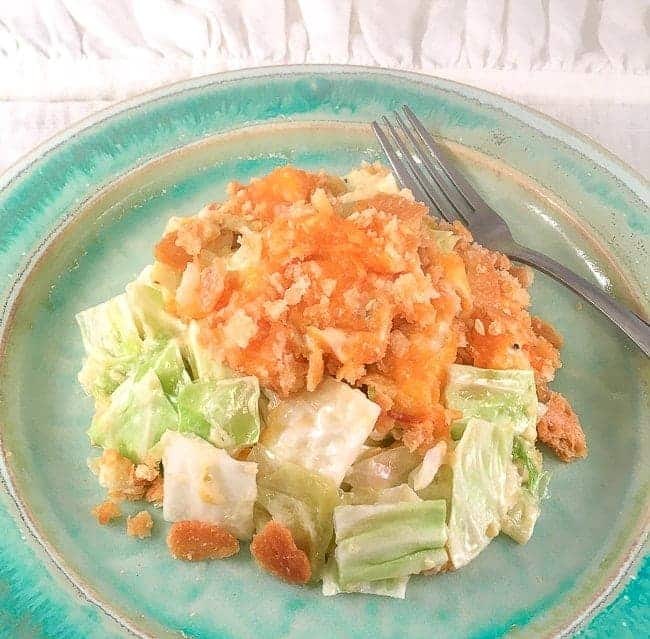 Cabbage casserole with a creamy sauce and cheesy cracker topping. 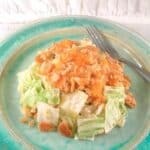 This cabbage casserole recipe is perfect for any large get together and is a great side dish. Goes great with ham and turkey! Placed the chopped cabbage (see recipe note) in a large casserole dish. Add the chopped onion, salt and pepper (optional cayenne), and 1/2 stick melted butter. Mix well. In a bowl, combine the cream of mushroom soup and mayonnaise. Pour over the cabbage. Mix the crushed crackers and cheese and pour on top of the soup mixture. Drizzle the remaining 1/2 stick melted butter on top of the cracker and cheese mixture. Bake at 350F for 30-40 minutes or until the cracker topping is crispy browned. Crispy or crunchy cabbage? Most people like cabbage either crunchy or soft. This recipe is easy and flexible. If you like it crispy and crunchy, then don’t pre-cook the cabbage. If you like it soft and tender, then pre-cook it before putting the casserole together. You can boil the chopped cabbage or pan fry for about 5-8 minutes. Then, proceed with the recipe directions. My mother makes this casserole every year for the holidays! I always enjoy it and look forward to it. This was delicious! My husband and I loved it. I just added shredded carrots to it. Thank you for the recipe. So glad the two of you enjoyed it, Cindy! Adding shredded carrots sounds really good! I’ll have to try that soon.